Concurrently on view in the Thinkspace project room is Tokyo, featuring new works by French-born, Los Angeles-based artist Liz Brizzi. 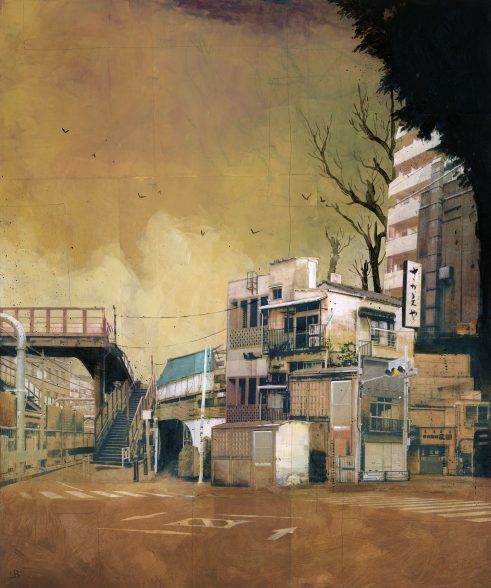 Known for her evocative mixed-media works on panel, Brizzi is drawn to derelict spaces and forgotten city recesses. An avid urban explorer constantly in search of abandoned relics and trace history, her works begin with in-depth photo documentation and physical exploration. Among her favorite destinations and recurring visual resources are LA’s Downtown core and endless suburban outskirts, in all their surprisingly beautiful imperfection. 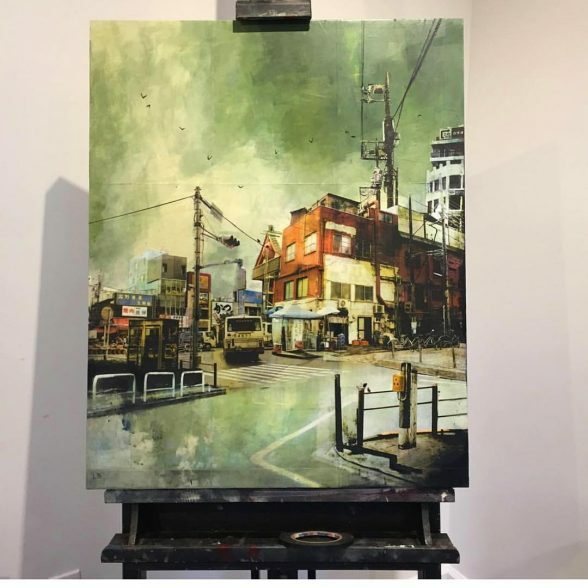 In her second solo exhibition with Thinkspace, Brizzi has traveled to Tokyo, Japan, transforming its urban textures into beautifully saturated and surreal composites. In search of an imperfect peace, Brizzi’s works are thoughtful and meditative, spun from quiet observation and creative reconstitution. She is always in search of the redemptive presence of histories, particularly those found in unlikely seclusions or empirically ‘unbeautiful’ places. This profound feeling of excavation persists throughout her work, conveyed visually through their mysterious pause, like an active seeking and uncovering. The poetic suggestions of isolation and philosophical loneliness are palpable somehow, in spite of Brizzi’s lush choice of palettes and highly pigmented rendering choices. Devoid of human subjects, her works focus on the remnants of human intervention, preferring instead to capture their relics and remains in the structures and delinquent architectures. 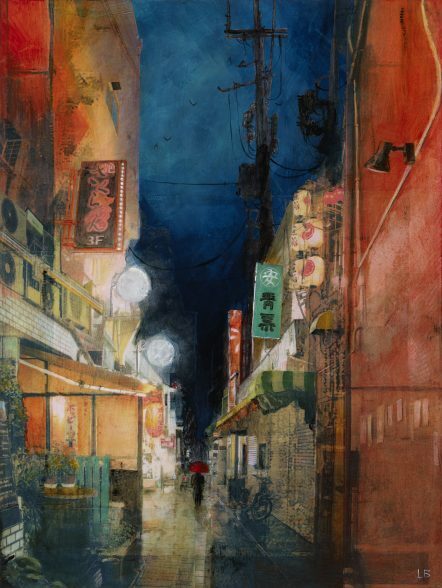 Her works begin with the photography she’s taken throughout the course of her urban excursions and international travels. Select images, or fragments, are then transferred to panel and painted into and over with multiple layers of diffuse acrylic pigment. The effect is surreal, otherworldly, and somehow closer to the real than the real itself, charged in part with the sensory impact of memory. At times, her compositions are direct representations of actual existing places and scenes, and at others, surreal composites assembled from splinters of several different places, moments, and observations. Though fundamentally familiar, once transformed by Brizzi, industrial urban vestiges, mundane cityscapes, and unassuming architectures become uncannily beautiful visual arrests.